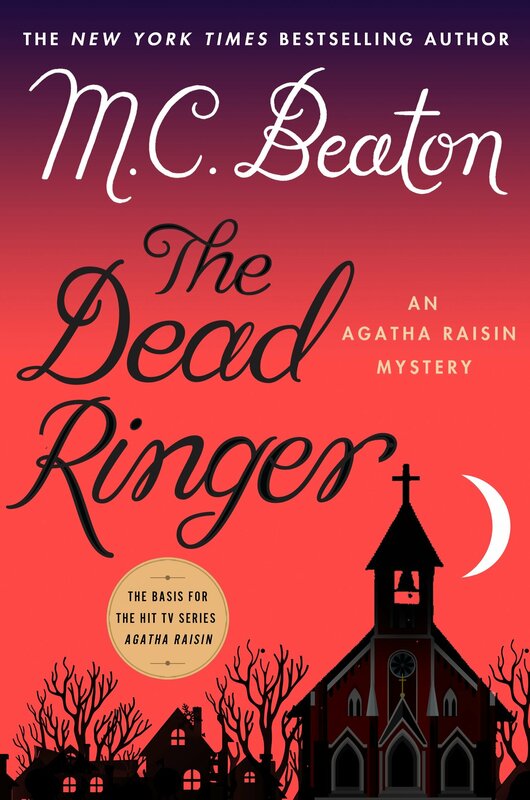 This week we are delighted to have a review and giveaway of the latest Agatha Raisin mystery by M.C. 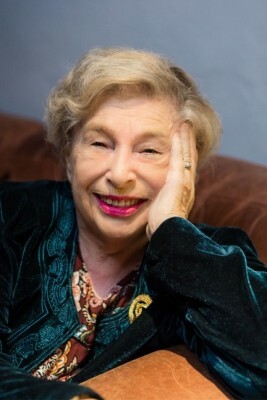 Beaton aka Marion Chesney, and we also have an interview with M.C. Details at the end of this post on how to enter to win a copy of The Dead Ringer, a link to purchase it from Amazon, and an indie bookstore where a portion of the sale goes to help support KRL. Agatha is bored with the usual cases for her detective agency, but when she gets involved with bell ringers, a missing woman, a beautiful bishop, and an old folks home, things get interesting. She has an off again/on again relationship with Charles. Neither really wants to get married, but it would be convenient plus they miss each other when apart. Charles tends to see young blonde women; Agatha falls in love on a regular basis, generally with unsuitable men. Agatha’s hired to find out what happened to the bishop’s former fiancé who disappeared without a trace but is distracted from the case by her own personal life. James, her ex-husband, lives next door and is getting serious with a Croatian woman. All in all, her personal life is a mess. The bishop has a habit of turning on the charm without effort, usually in order to raise money for an old folks home. Since he doesn’t seem to have a generous bone in his body, it’s hard to determine his motive in being so caring about elderly women. They, however, are his target for raising funds as he promises each his undying love. Agatha has more mysteries to solve than just the young fiancé’s disappearance. There’s a missing policeman, another missing woman, cranky twins, a couple or three deaths, missing money, kidnapped cats, and love gone wrong. This is the thirtieth book in the long running, popular series. Agatha isn’t afraid to tell people just what she thinks, rude as that may be. She falls in love quickly and out again but is loyal to James and Charles and her friends. She calls herself an intuitive detective in that she hasn’t any resources for forensics or autopsy results but relies on her feelings and thoughts. Odd as her reasoning may be, she does find the killer in the end. For a confusing romp through the English countryside to solve a mystery with a satisfying end, have a cup of tea and spend time with Agatha Raisin. Beaton has also written four Edwardian mysteries. KRL: What brought you to choose the setting and characters in your Agatha Raisin series? Please tell us a little about the setting and main character for your most recent book. M.C. : My editor at St. Martin’s Press, Hope Dellon, wanted a Cotswold detective story. I live in that English beauty spot called the Cotswolds. It was easy for me to set the books there, so the characters and settings in the recent book are set in that famous English beauty spot. M.C. : I am not consciously writing to entertain – it could be that I have a frivolous mind! All I ever wanted readers to do was to escape from reality through my books. M.C. : I do not have a schedule. I stare at the computer and get inspired to iron my socks or defrost the fridge, but as any writer knows, you have just got to write. M.C. : I write the plots in advance and then I just begin at the beginning and go on to the end. M.C. : As an author, I have been very lucky. I used to write Regency novels, but I had a six-book series called The Six Sisters that my agent, Barbara Lowenstein, was having a hard time selling because it was during the great Regency slump, the markets being flooded with badly researched historical rubbish. But the indefatigable Barbara sold it to Hope Dellon, and it was produced in six volumes a la Jane Austen and was a great success. KRL: How do you feel about the new Agatha Raisin TV show and do you have any input? M.C. : I have very little input into the TV shows, or, rather, I had to stop myself because manipulation and control are my character defects, and I had to remind myself that script writing is not one of my talents. M.C. : Writers I love? Too many to list. But Dorothy Sayers. Agatha Christie, John LeCarre, Josephine Tey are close to my heart. M.C. : Research is mostly studying and listening to people. Just so long as I find people more interesting than myself, I will always be inspired. KRL: What do you like to read? M.C. : I read detective and spy stories. M.C. : Favorite TV? That recent superb production of Vanity Fair. Favorite movie: Wag the Dog. M.C. : I would advise any aspiring writers to write what they enjoy reading. Don’t attempt romance, children’s books or poetry because you think they might be easy. Also, do not look to your husband for support. All he will probably do is say you spelled cat wrong on page three, and your best friend will tell you it is marvelous. You must believe in your work because you may have to take unfair rejection. A lot of luck is involved. M.C. : Perhaps people might be surprised to learn I do not find travel romantic. Sometimes the pinnacle of my week is playing Scrabble with my friends Sue and Barbara, in the village. People might indeed also be surprised that, being a crime writer, I do not find murderers interesting. In real life, they are mostly boring psychopaths. I prefer to imagine them as something different. You can find M.C. Beaton online on her website and on her Facebook page. 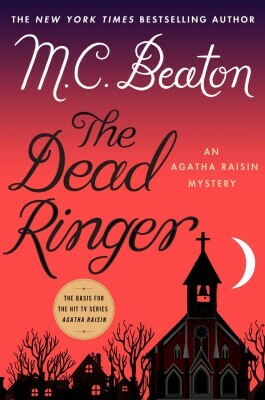 To enter to win a copy of The Dead Ringer, simply email KRL at krlcontests@gmail[dot]com by replacing the [dot] with a period, and with the subject line “ringer,” or comment on this article. A winner will be chosen December 8, 2018. U.S. residents only. If entering via email please include your mailing address (so if you win we can get the book sent right out to you), and if via comment please include your email address. You can read our privacy statement here if you like. Check out other mystery articles, reviews, book giveaways & mystery short stories in our mystery section. And join our mystery Facebook group to keep up with everything mystery we post, and have a chance at some extra giveaways. Be sure to check out our new mystery podcast too with mystery short stories, and first chapters. I am so glad there is a new Agatha Raisin! I love this series! I really want to read this. Thank you for the chance.? I don’t think I have ever read an interview of MC. Thank you so much for doing that and sharing her insights with us. I would love to win the latest ‘Agatha’ book. I really liked the review of the book and I’m looking forward to reading the book. Agatha Raisin novel to my collection. I would love to add the latest Agatha Raisin novel to my collection. Read and own hard copies of Agatha Rasisn books.